Double-edged Sword is a survival story like no other. In 2003 Simonne Butler’s violent partner, high on methamphetamine, cut off both her hands with a samurai sword. Her hands were reattached in a groundbreaking marathon surgery and she spent the next decade healing her mind, body and spirit. Despite five years in an extremely physically and emotionally abusive relationship, Simonne always had an unbreakable spirit. Even when her self-confidence and sense of self-preservation was at rock bottom, she was able to source phenomenal strength that saw her survive horrendous blood loss and being left for dead for hours, holding her severed limbs in such a way that allowed revascularisation to be possible. Facing obstacles from the very start, including a troubled childhood and an alcoholic and volatile mother, Simonne’s optimism and determination have always shone through. Every victim of domestic violence must read this book, and their friends and family. Even those who have never been the victim of violence will be inspired, moved and enlightened by this candid and brutal memoir. Double-edged Sword is so much more than just a story of survival, it is a guidebook for humanity – how to shrug off the oppressors and the obstacles and live your life with the greatest intensity you can muster. It’s about conquering the demons and rising like a phoenix from the ashes and learning how to live with passion, honesty and love. 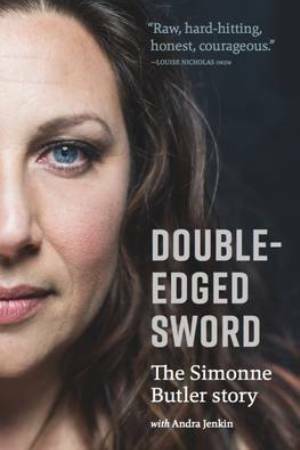 Double-Edged Sword is a brave, horrific and no-holds barred account of a terrible and terrifying incident that changed Simonne Butler's life in just a few minutes. "On 21 January 2003 the man who I was once in love with, the man who said he loved me, attempted to decapitate me with a samurai sword." This is the first line of Simonne's extraordinary story. It's a story of a woman who thought that she had finally found someone to love her and take care of her, and who gradually realised that this 'love affair' was actually toxic. Whilst Simonne's story is well known in New Zealand, I had not heard of her, or what happened to her before. I read this book with no prior knowledge, I hadn't seen the TV reports, or read the news articles, all I had was Simonne's voice, telling her story, in her words. It could have been easy for Simonne to gloss over her dysfunctional family life and her history of alcohol and drugs, but she doesn't. This is a brutally honest account of a life that was difficult from childhood. Simonne's mother was an alcoholic; a functioning alcoholic for most of the time but incredibly cruel and distant towards her daughter. When Simonne finally left home, aged twenty-one and her flat-mate's boyfriend Tony began to show an interest in her she found it very difficult. On one hand she knew that he was trouble, but on the other hand, she was attracted to him. Tony and Simonne began a relationship and moved in together. What follows is a downward spiral of danger and terror and whilst Simonne knows that she should leave, and does try, she becomes so worn-down, that even when she finds out the truth about Tony's past, she stays. The night that Tony tries to kill Simonne and her friend is described in graphic detail and makes for incredibly painful reading. God only knows how those two women survived such a determined and brutal attack on them, but they did, and Simonne relates her healing journey with both humour and incredible insight. This is a book that is disturbingly compelling, it almost feels voyeuristic to continue to read of Simonne's struggle to be loved. Her incredible strength after such a devastating and life-changing attack is astonishing and she tells her story with such honesty and a touch of humour. Double-Edged Sword is a book that should be read by everyone, it is raw, inspiring and enlightening.